Five Road Trip Tips…say that five times fast. A year ago, I went on the road trip of my life. I packed up my Beetle and moved from California to Minnesota to move in with my then boyfriend (now husband). 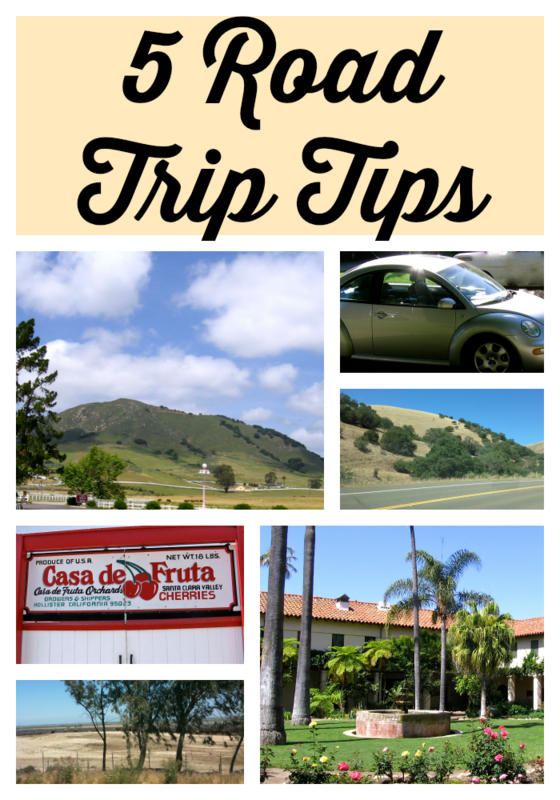 I picked up a few road trip tips along the way. Like don’t drive through Wyoming in months that aren’t June, July or August or you’ll get trapped by a snowstorm. My family was big on road trips when I was growing up, so I’m a pretty seasoned road tripper. Is that like a Day Tripper? Now I’ve got that song in my head. We drove down Interstate 5 on our way to southern California more times than I can remember. I think I’ve memorized all of the Starbucks between Stockton and Valencia. We drove to Denver one year. I’d never seen so many fireworks stands outside of the Fourth of July. We drove to Lake Tahoe a few times…that’s not really much of a road trip since it’s under 3 hours. I think it has to be at least a 4 hour drive to be deemed a “road trip” otherwise it’s just a weekend getaway. Whether you are just going away for a long weekend or the rest of your life, here are a few things I’ve found to be helpful. Water. Bring water or some sort of drinks in the car. You will get thirsty and odds are it will happen in the middle of nowhere. It’s hard to believe we still have middles of nowhere in our country, but there are quite a few. Sunglasses. I don’t care if it is the middle of winter when you road trip, there is still a strong possibility that you could be squinting for a significant portion of the way. Music. Bring an iPod or a few CDs or something for the love of all that’s holy. If you’re not lucky enough to be able to afford satellite radio, you’ll spend half of your trip trying to keep yourself from dying of boredom…even if someone else is in the car with you. Besides, if you’re in a mountainous area or somewhere chock full of trees, you might not be able to get a good satellite signal anyway. And don’t rely on Pandora either. See what I just said about satellite signals. Cell signals can be scarce in many parts of the country. Odd, I know. Hand/baby wipes. If you’re like me, you hate it when your hands feel dirty. Then again, things can get messy in the car from time to time and you might want to have that snack you brought. Or maybe you just spilled your Pepsi all over yourself… you’ll thank me when you don’t have a stain or sticky fingers. What tips do you have for road tripping? Any road trip tips to share? This entry was posted in Travel on April 22, 2014 by Amy Ruiz Fritz. Ah yes. I don’t leave home without wearing sunblock. I’d rather be pale and look 10 years younger than my age than tan and look 10 years older. A notepad is a great idea! You can’t rely on technology all the time, plus it might be easier to jot something down than whipping out your phone only to realize it’s out of juice. Of course, I usually use my phone as a GPS, so it’s usually busy. YES on the wet-wipes! (Or whatever people call them. There are many names, I guess.) I also hate having dirty hands. I have 3-4 of these in my purse at all times, just in case — even when I’m *not* road-tripping. Because you never know. I’d also recommend hand cream, depending on where you’re road-tripping. Some parts of the U.S. are quite dry, so if you’re washing/wiping your hands a lot there, your hands will get dry as well. I hate the feeling of dirtiness/stickiness the most, but dry is also up there, so some sort of follow-up moisturizer is important to me (though maybe not to others).